What is a laparoscopic bowel resection? Laparoscopic bowel resection is a type of surgery. It removes a part of your intestine. It uses very small cuts, called incisions. To do this surgery, a doctor puts a lighted tube through incisions in your belly. This tube is called a scope. It lets your doctor see your organs. Next, he or she puts special tools through the tube to take out part of your intestine. Then the doctor puts the healthy parts of your intestine back together. You may have this surgery if your intestine is damaged or blocked. Crohn's disease and cancer can cause these kinds of problems. 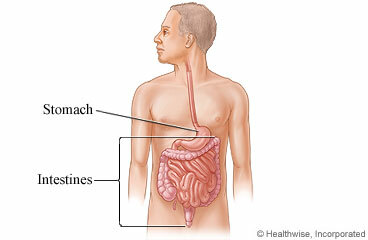 Diverticulitis can also cause them. You will probably stay in the hospital for about 3 to 5 days. You may be able to do your normal activities in 2 to 4 weeks. You may need to take antibiotics before surgery. A day or two before surgery, your doctor may have you stop eating and have you drink only clear liquids. You may take laxatives to clean out your bowels. You also may take an enema. Your doctor will tell you how to do this. The surgery will take 2 to 4 hours. Enter F784 in the search box to learn more about "Laparoscopic Bowel Resection: Before Your Surgery".